RESTAURANT EXPANSION 158 • SHOPPING CENTER BUSINESS • May 2018 of these sites lack great access, they lack great visibility, they don't have high traf- fic counts and they don't even necessarily have big anchor co-tenancy. The Heights is a site that's very interior focused, but the design of the location was appealing enough to help Postino overlook a lot of site attributes that other retailers would be seeking. SCB : What kind of locations are restau- rants looking for, in general? BAKER : It truly is a mix. There's a con- tinuum. You've got the national brands, some of them with thousands of loca- tions open, and they tend to look for the same characteristics because historically those have worked for them. Those ten- ants have a very particular site selection process, and in the fast-casual world, that is sort of the same across the board. A lot of these concepts in the 2,500- to 3,500-square-foot space are looking for the exact same locations. Then you've got the example of the full-service restaurants, who tend to want larger spaces with lots of parking. They tend to also be a bit more regional, and tend to want to front ma- jor thoroughfares. Then, concepts such as Snooze and Postino who are looking for sites that feel more homespun, local and older. Adaptive reuse is a word that's been thrown around a lot, but that tends to be the kind of space that they're looking for. Then there's a completely separate cate- gory all together, the popular chef-driven restaurants. That segment continues to be active, and those groups tend to look for the type of space that's appealing to Snooze and Postino. For example, Fox Restaurant Concepts, based in Arizona, has more than a dozen concepts that are all very unique, like Flower Child, Zin- burger and North Italia. They are taking many of those brands across the country right now. There are chef-driven con- cepts. Ford Fry, a chef based in Atlanta, is busy expanding in Houston right now. He has done extremely well with his first restaurant here and is looking to roll out several new concepts. SCB : The two examples you just gave seem to be duplicating success in markets sim- ilar to the ones where they've launched and succeeded. Do you see that often, where concepts take what works for them and try to find those charac- teristics in other markets? BAKER : I think so, to a certain extent. As these concepts come into the market they're going to have a local broker. One thing that's a constant among all retailers — and frankly every category of retail — is there are only a certain number of deals to do in any given year. For the most part with these retailers, particularly the restaurants, what they are looking at first is where the like-kind brands have been successful. And that's even nuanced. Snooze, although primarily a breakfast concept, is looking at sales that occur at lunch and dinner to ensure they draw in enough customers during those hours. They have to be mindful of where they locate in a project because of their hours of operation. It might not make sense for them to look at a project where they go deep into a body of the project and none of those retailers open until 10:30 or 11 a.m. If they're not going to have the ben- efit of piggybacking on the traffic that's generated by those retailers, they need to really think carefully about their position within the project. 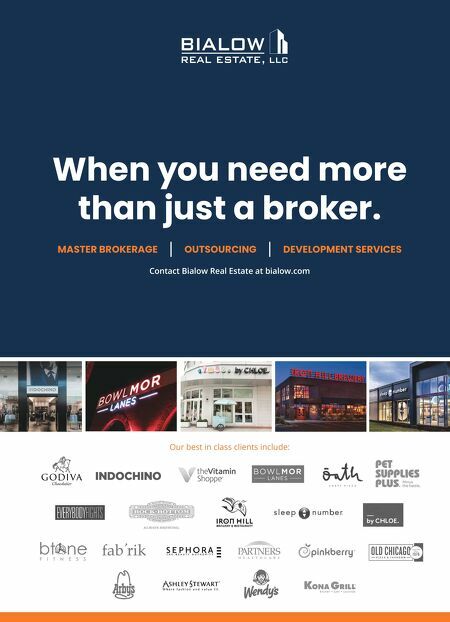 One of the first things that a good broker is going to provide — and that a great retailer is going to look at — is the performance of other retailers in the market and their sales. Before they spend too much time turning up options in this trade area, we need to understand that the trends in this market are already strong. To me, that is the starting point for any good site selection. SCB : Owners and developers say that restaurants are a gamble. How do you, as a broker, negotiate a lease and sell the idea of a restaurant to them? BAKER : It is a competitive space, and in the retail world, it is as competitive as any space. Years ago, the rule of thumb in our market was that seven out of 10 restau- rants close within the first four years of opening. While that's a big generalization, my guess is it's probably true even today. The failure rate with restaurants is proba- bly as high as any other category of retail. One of the first things that we do in our due diligence is believe in the concept. We could work with a lot more restaurants than we do today, but we choose not to be- cause there just aren't that many concepts that we really believe have staying power. 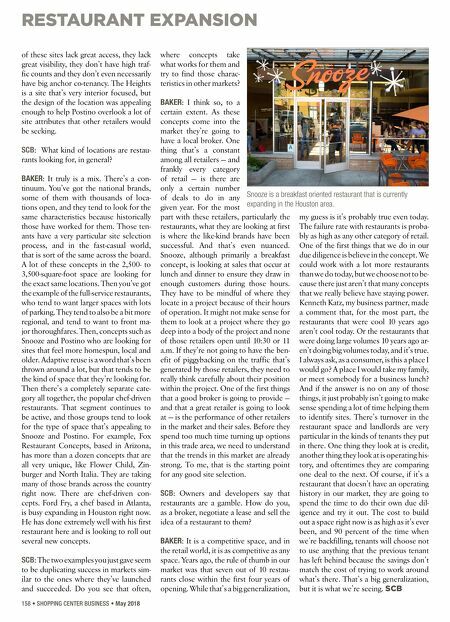 Kenneth Katz, my business partner, made a comment that, for the most part, the restaurants that were cool 10 years ago aren't cool today. Or the restaurants that were doing large volumes 10 years ago ar- en't doing big volumes today, and it's true. I always ask, as a consumer, is this a place I would go? A place I would take my family, or meet somebody for a business lunch? And if the answer is no on any of those things, it just probably isn't going to make sense spending a lot of time helping them to identify sites. There's turnover in the restaurant space and landlords are very particular in the kinds of tenants they put in there. One thing they look at is credit, another thing they look at is operating his- tory, and oftentimes they are comparing one deal to the next. Of course, if it's a restaurant that doesn't have an operating history in our market, they are going to spend the time to do their own due dil- igence and try it out. The cost to build out a space right now is as high as it's ever been, and 90 percent of the time when we're backfilling, tenants will choose not to use anything that the previous tenant has left behind because the savings don't match the cost of trying to work around what's there. That's a big generalization, but it is what we're seeing. SCB Snooze is a breakfast oriented restaurant that is currently expanding in the Houston area.